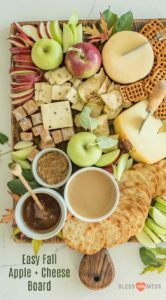 How to make a simple fall apple and cheese board that is perfect as a snack, appetizer, or party platter. Have you all gotten on the cheese board bandwagon yet? I feel like it’s getting more and more common, and I love it! My friend Mary introduced me to the art of cheese boards almost three years ago and I absolutely love making and eating them. I get together with a group of other moms on Tuesday mornings. We snack and laugh at a Hallmark movie and the kids all play. I bring a cheese board a couple of times a month and everyone loves it. I’ve made lots and lots over the years, and I wanted to start sharing some of the inspiration on the blog. I plan on doing a more in-depth “how-to” post soon. 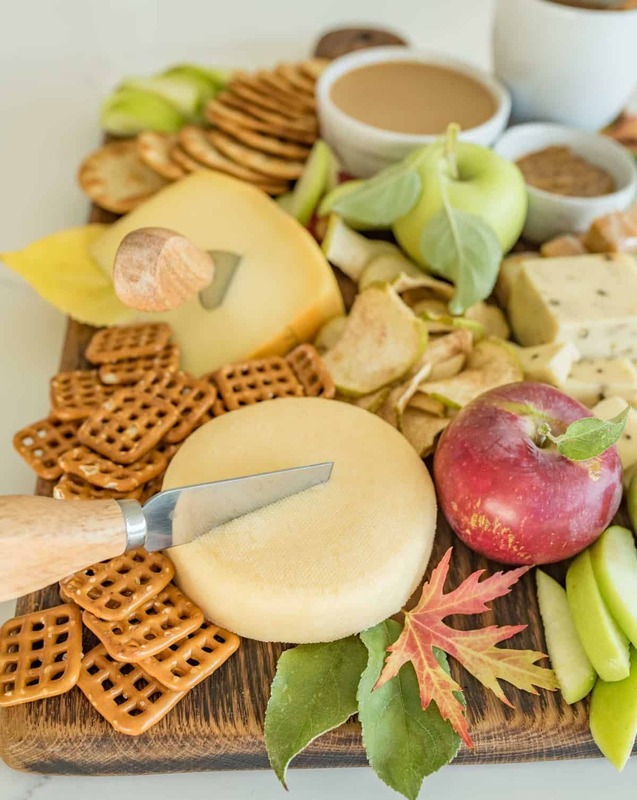 Cheese boards are fun because well, cheese. They are also beautiful and easy to customize. 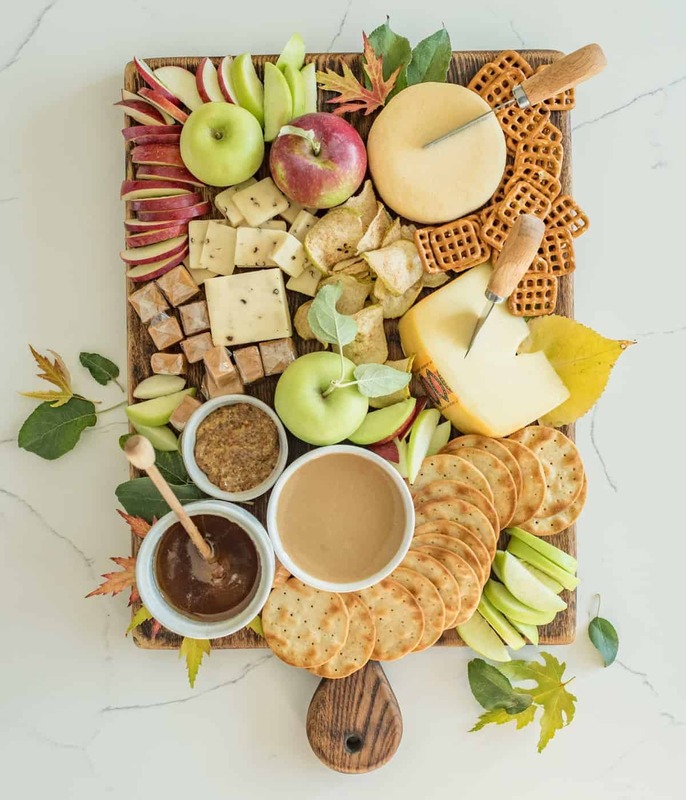 This fall cheeseboard features some really simple cheeses (Swiss, Gouda, and cheddar) paired with apples and a few other seasonal items like my famous caramel dip, caramel candies, and dried apples. It’s simple, seasonal, and delicious. 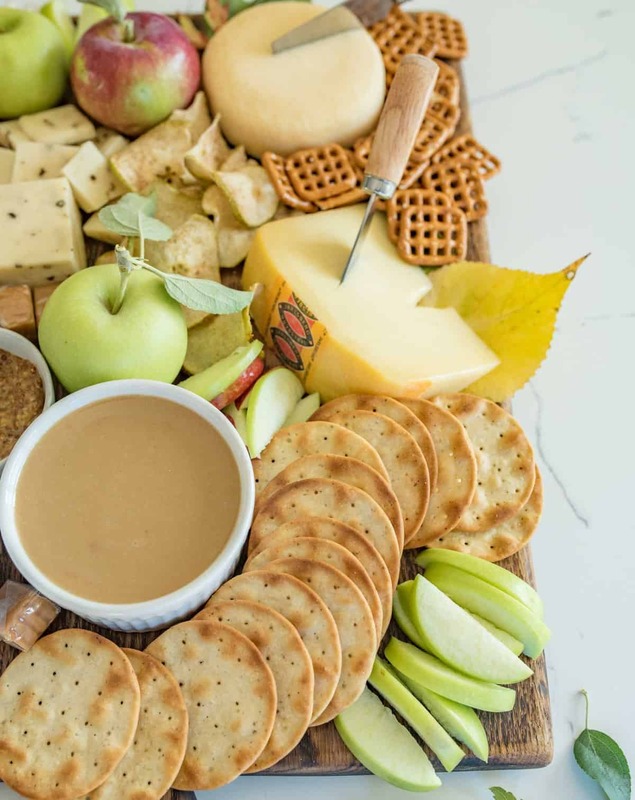 Half of the fun of a cheese board is stacking up your crackers with different combinations of cheese, fruit, and condiments. My favorite is always a cracker with cheese plus an apple slice, a little bit of whole grain mustard, and just a drizzle of honey. You’ve got to try it stacked up just like that. And trust me on the mustard even if you don’t normally like mustard. I’ve converted many-a-friend to this combo – even the mustard haters. It’s just a well balanced bite that will send your taste buds singing! There’s no wrong way to cheese board! That’s the beauty of it. You could add just about anything you’d like (such as caramel popcorn, nuts, olives) or take off anything you don’t like. 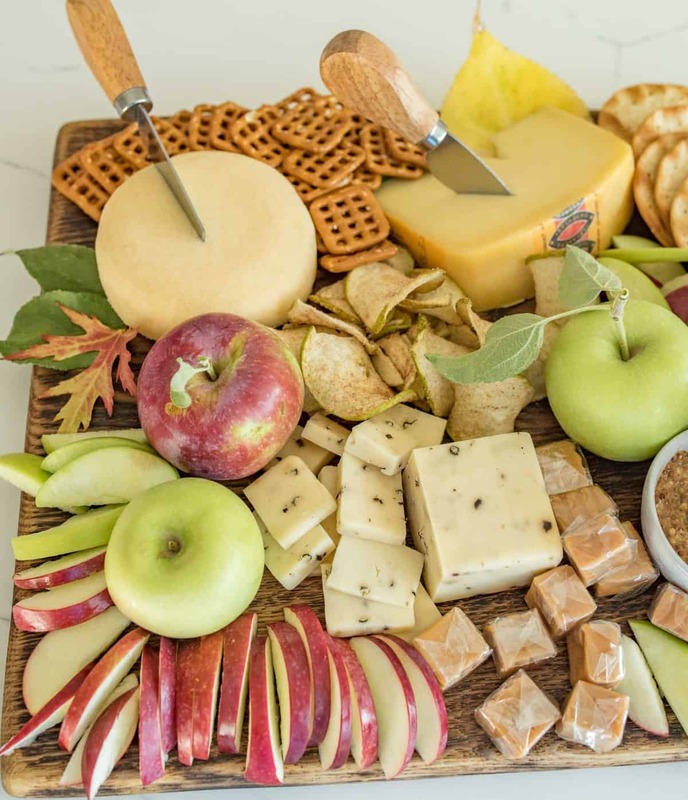 A cheese board also doesn’t have to have a million items on it for it to be pretty, tasty, and a whole lot of fun to eat. I have made some really large cheese boards and some small ones like this. This is a great example of a few good ingredients done well. Thomas bought these very inexpensive cheese knives for my stocking last Christmas, and I love them! I use a few nice boards and these knives over and over again. I have the best luck buying pretty boards on Etsy. I know Target and Sur La Table have nice boards, too. I bought all of these cheese in the little store the next town over. They aren’t fussy and should be easy for you to find, too. They are classics you’ll go back to again and again. 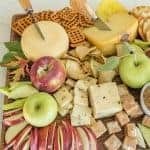 How to make a simple fall apple and cheese board that is a perfect snack, appetizer, or party platter. Place condiments (caramel sauce, honey, and mustard) in small serving bowls and place on board. Add a few whole apples and lots of apple slices. Fill in the gaps with dried apples and caramel candies. That was so fun to make, write up, and share! I hope you all enjoyed it because there’s a whole lot more cheese board coming your way. Enjoy from my kitchen to yours.